The article gives a simplified description of the mechanism of self-oscillating displacement of the indenter in the direction of the velocity at the surface plastic deformation. Telkov I.V. 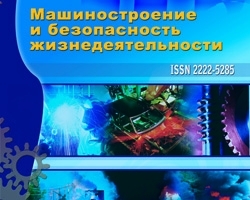 Improving the design of tools for processing viscous ductile metals by surface plastic deformation // Engineering industry and life safety, 2010, № 7. – P. 147-149. Chepa P.A., Andriashin V.A. Operational properties of hardened parts. – Mn. : Science and Technology, 1988. – 192 p.
Smeljanskiy V.M. Mechanical surface layer hardening of machine parts in processes of surface plastic deformation. – Moskow: MASHMIR, 1992. – 60 p.
Markovets M.P. The mechanical properties of metal hardness. – Moskow: Mashinostroenie, 1979. – 191 p.
№2 (12) 2012, Self-oscillatory movement of the indenter in the direction of the velocity at the surface plastic deformation, Telkov I.A.